The last couple of days the temperature has been very high. The purple crocus and the intense yellow color of the daffodils can be seen at numerous flower fields. Last week we had only one field and now the fields are starting color. The first reports of a blooming pink hyacinths field are in. I have to check that report for myself. At this moment we don’t have any signs of an early tulip field in bloom. This week the weather forecast predicts a wonderful warm and sunny spring time week. I expect to see a lot more crocus and daffodils next weekend. 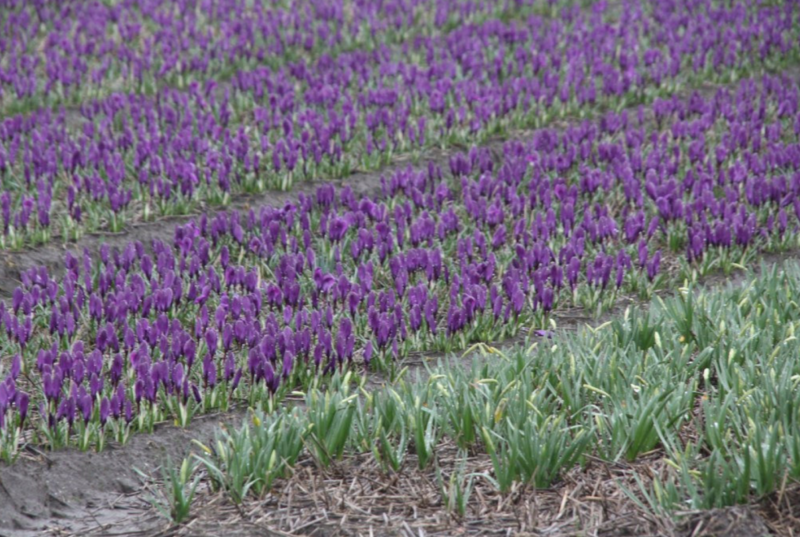 And maybe some colorful hyacinth fields too. After next week the forecast says the temperature is going back to normal. will the flowers be in bloom by 29-30 March ? There will be flowers in bloom by 29 – 30 march. At this point you can find crocus and daffodils in the flower fields and a couple of hyacinths. In the Keukenhof you can find tulips in bloom at the indoor flower exhibition and outside you can find crocus in bloom. However it will be too early to see flower fields full with tulips.